My boyfriend and I play a lot of Magic. 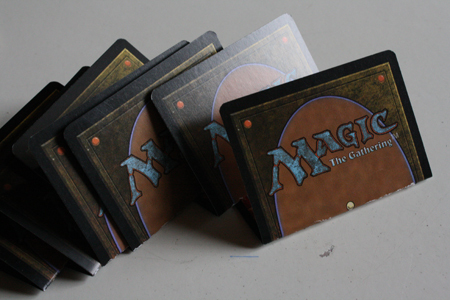 And playing a lot of Magic means having a lot of Magic cards around the house. A lot of cards. We’re talking infestation levels. We had to empty one of our dresser drawers in order to store them all, and the collection keeps growing. You regular readers know by now that overabundant materials in our apartment are first in line for crafting fodder. 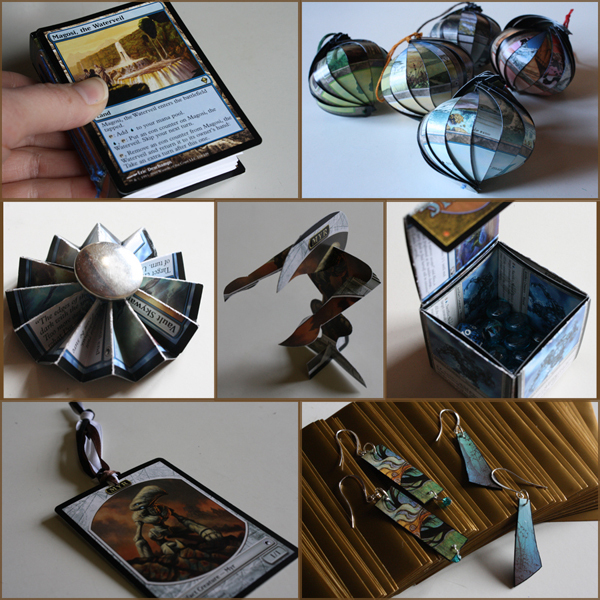 I’ve been looking for ways to put some of our Magic cards to other uses, and so far I’ve come up with seven different crafts to use up extra Magic cards and tokens. These cards are great for crafting, as they’re sturdy and durable (a friend recently left one out in the rain overnight and other than some slight warping it was undamaged), and they’re basically art cards, so they provide a great deal of colour and aesthetic to work with. 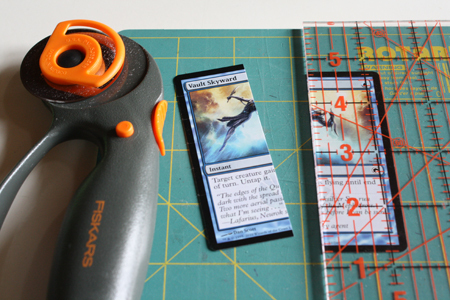 Here are seven craftsy uses for your Magic cards. On those rare occasions when one is not playing Magic or video games or Tweeting, it’s sometimes nice to curl up with a good book. You’ll want to get back to your games and Twitter before reading the entire book, though, which means you’ll need a good bookmark. 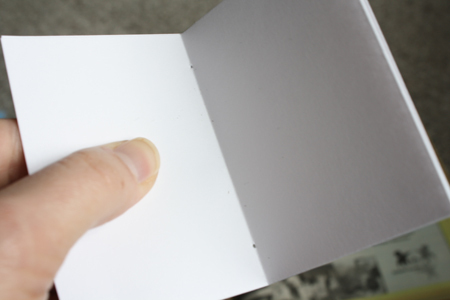 1) Punch a hole in the top middle of the card. 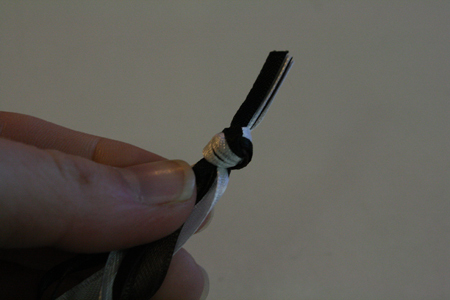 2) Fold your ribbon or embroidery floss in half and knot the lose ends together. 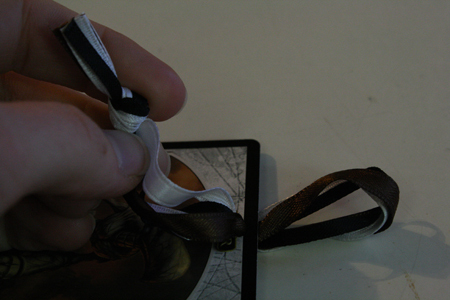 3) Poke the folded end of the ribbon through the hole in the card. 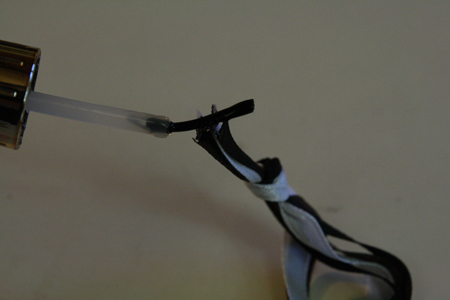 4) Put the knotted end of the ribbon through the looped end and pull it tight. 5) [optional] Keep the ribbon ends from fraying by dotting them with clear nail polish. 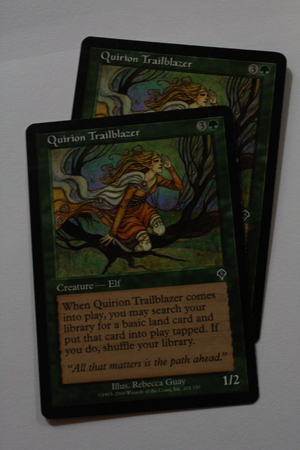 I mentioned that Magic cards are really a type of art card, often featuring pretty pictures and lovely swirls of colour. 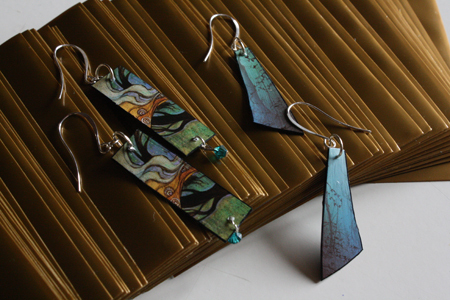 You can make some rather elegant paper jewelry by cutting out just the right piece of a card, and using my tutorial on paper earrings. Just ignore the instructions to cut circles (or don’t – you can use circles if you want to), and cut rectangles or other shapes that fit into the area of the card you want to use. 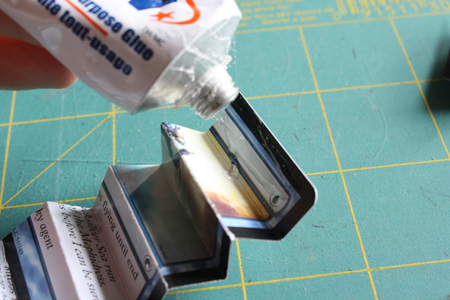 Since Magic cards are already quite sturdy and have a nice finish on them, you’ll probably only need to use one coat of varnish. 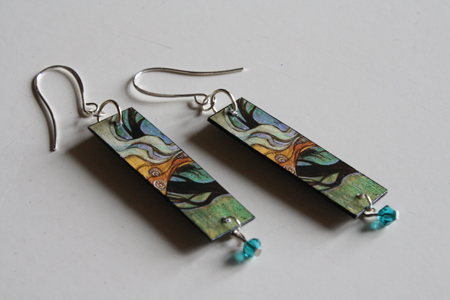 You could even do these ones without the varnish if you needed to. 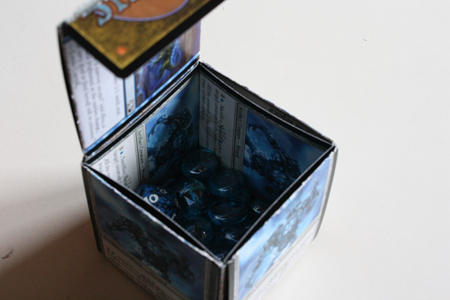 If storage is a problem, use a few Magic cards to make a box for your counters. Or for loose change (save up for more boosters! ), polyhedral dice (if you play Magic odds are you have a bunch of these sitting around, too) or any other small stuff that’s rattling around the house. 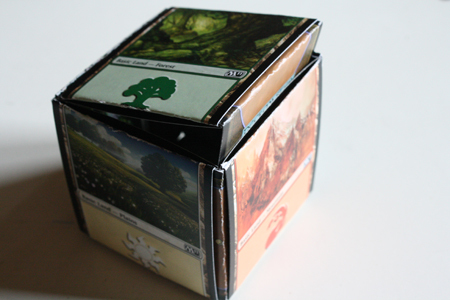 I found several tutorials online for making these boxes from ordinary playing cards, so here is my version of the same thing, but with Magic cards. 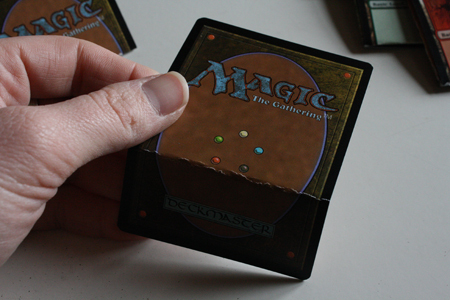 20 Magic cards – 6 will be visible on the outside of the box, 6 will be visible on the inside of the box, and the other 8 will not be visible at all, except for a small portion of their generic Magic card back side. 1) Lay one card on top of another so that they are lying in opposite directions and a bit of the bottom card pokes out on either side of the top card. 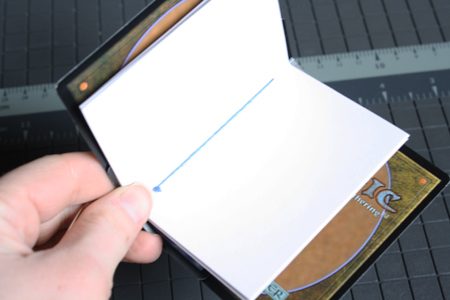 Fold these visible edges of the bottom card over the top card. 2) Flip the two cards over and do the same thing from the other side so that both cards form a square. 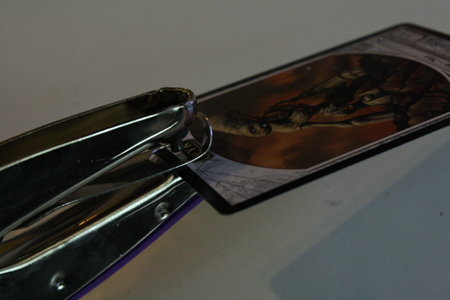 3) Detach the two cards from one another. Face their back sides (the brown side that says “Magic”) together. 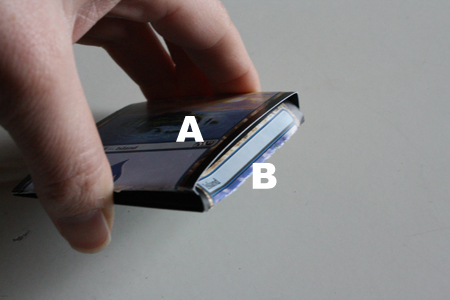 The folded tabs of one card should be at its top and bottom, the folded tabs of the other card should be to the sides. Slot the ends of card A’s tabs over one tab of card B. 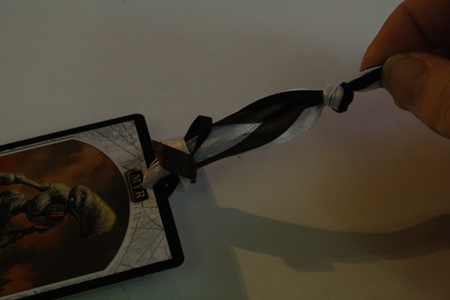 4) Now tuck card B’s remaining tab into the other end’s of card A’s tabs. You now have a relatively flat square made from two cards. 5) Repeat this process with 10 more cards, so that you have a total of 6 squares. 6) Take 7 of your remaining 8 cards, and fold them in half, folding the pictures in on themselves so the back sides of the cards are showing. 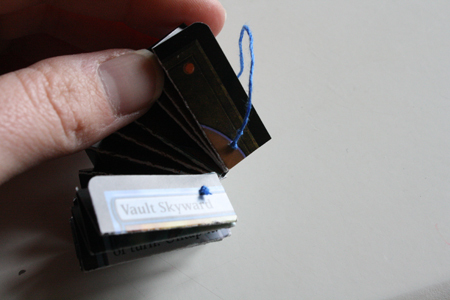 8) Use the folded cards as connectors, slotting them into the sides of your card squares to hold the squares together. Use this to form the sides of a box, then use two connector cards to attach the bottom of the box. 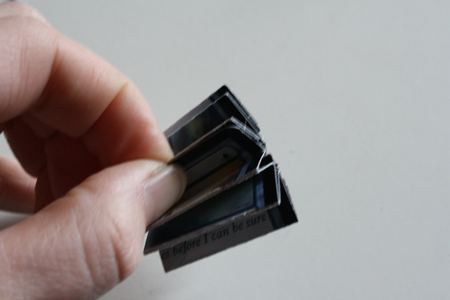 10) Take the last card, the one you haven’t folded at all yet, and fold the bottom (or top) third of it inward. 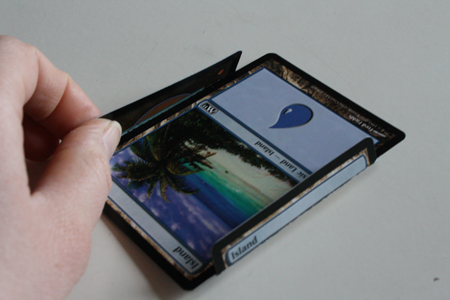 11) Slot this card into the front of the lid, with the card’s shorter end sticking out. This is your flap to close the box lid with. Sure, using Genesis Chamber and Myr Battlesphere to spawn a dozen adorable metal killing machines is great, but you know what’d be even cooler? If your adorable metal killing machines could stand up and stare your opponent in the eye as they blow up his dudes. 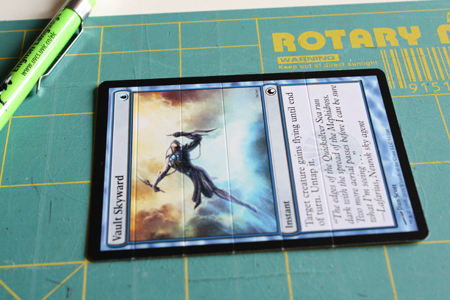 1) Print the Myr token template and cut out the pieces. 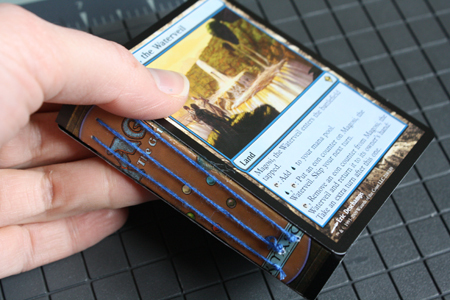 2) Trace each piece onto a Magic card. 3) Cut out the pieces. 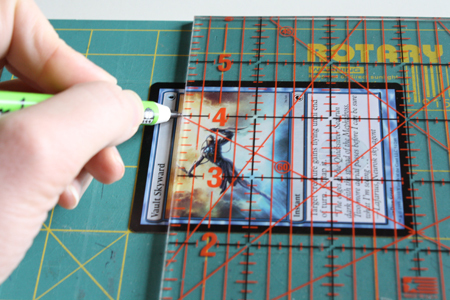 Cut slits that correspond with the red lines on the template. 4) Slot the pieces together. 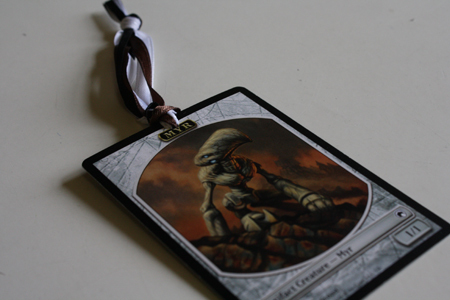 Try making templates for other tokens, as well. Birds, Ooze, Goblins, Eldrazi Spawn, etc. 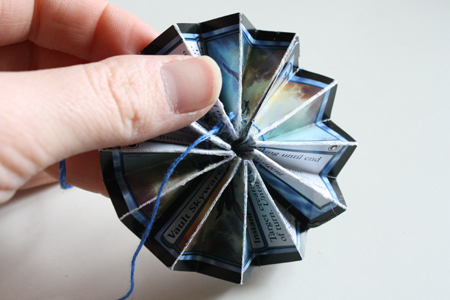 With those pretty pictures, Magic cards can make some lovely and surprisingly elegant paper ornaments. Put them on next year’s Christmas tree, or just hang them around the house, in front of the windows, off of potted plants – whatever. 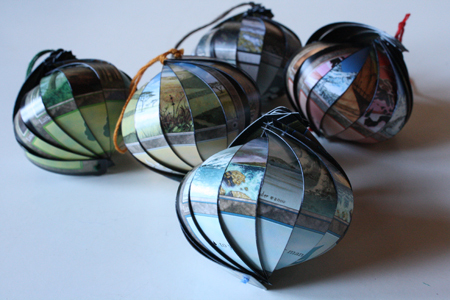 In December I actually created a whole tutorial for making these paper ornaments, which you can find here. She will positively gag at how geeky you are, but be utterly charmed by the fact that you made her something. She will decide that since you are clearly trying so hard to win her over to this nerdy game she should at least give it a try. She will realize that getting you to be “normal” is clearly a lost cause and leave you, in which case you really haven’t lost anything, and can just try this on the next, more appropriate girl who comes along. She will be astonished that you crafted her something, demand that you teach her how to do it, and get so turned on by your resulting demonstration of crafting prowess that you will not get to finish the lesson, if you know what I mean. So, how to make an accordion flower. barrette, headband, ring base, card or whatever else you want to attach the flower to. 1) Using your ruler and the tip of a mechanical pencil without any lead poking out, score* lines across the card every half inch. Do this for each card. *Scoring (in this case) simply means making a dent or crease in the paper, so that it will fold more easily. 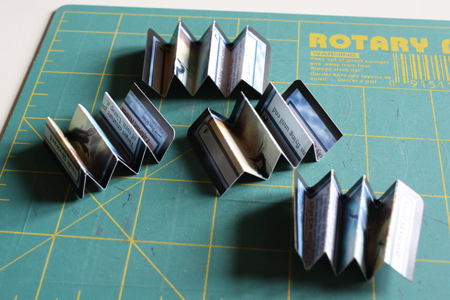 2) Cut each card in half vertically. 3) You should now have 4 pieces of card. Fold each of them along the score lines, in a back-and-forth accordion manner. 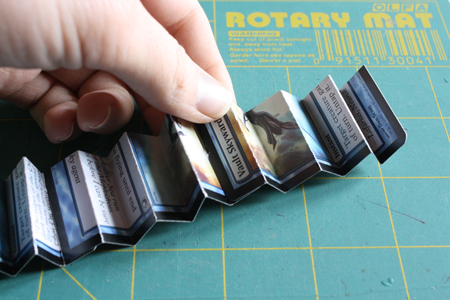 4) Glue the end of one folded card piece to the end of another, and so forth, until all four are glued in a row. Let them dry completely. 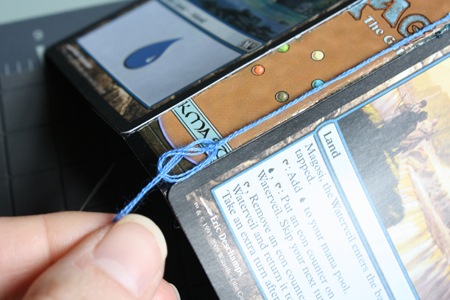 5) Using a needle and thread, poke a hole and pull your thread through each upper v-shaped fold along one edge of your line of card. 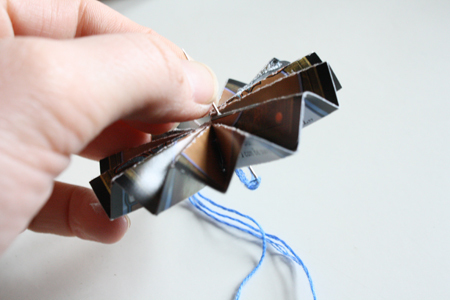 6) Pull the thread as tight as possible, thus forcing the line of folded card into a more circular shape. Knot the thread. 7) Glue the two ends together. Use a clip to hold the ends in place (or you can just hold them, and watch an episode of Dr. Who while you wait for the glue to set) and let the piece dry completely. 8) Take your needle and thread and, on the same side of the circle you sewed through before, sew through the v-folds that you did not sew through in step 5. Pull the thread tight while pushing the sewn side of the cards inward, thus forcing it into a flat circle and keeping it in that shape. Knot the thread, but do not cut it. 9) Use the thread still dangling from the flower’s center to sew a bead or button to the middle of the flower. Then use it to sew the flower to any kind of backing (barrette, headband, etc.) you wish. It’s always useful to have a place to keep track of your health (in game, I mean), or to make notes when you’re suddenly struck with an inspired idea for a new deck. 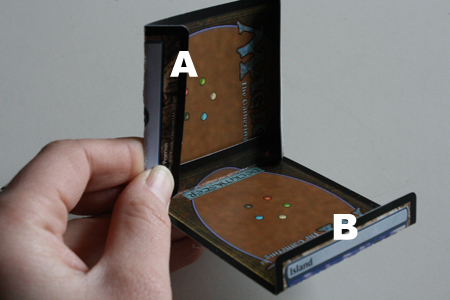 Keep it all Magically themed by making yourself a sweet and conveniently small notebook out of Magic cards. 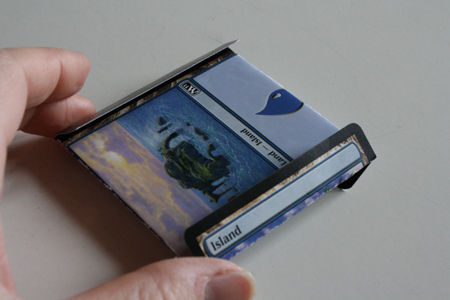 In fact, since it’s made from Magic cards, this little notebook can even fit into your deck box. 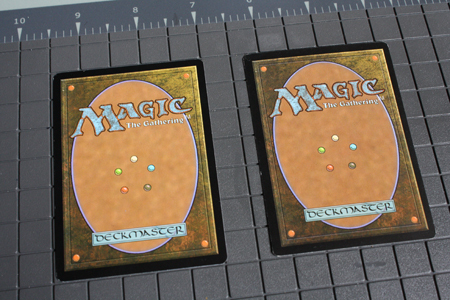 3 Magic cards – 2 will be visible – one as the front cover and one as the back – and 1 will only be visible on the inside of the notebook. paper – plain white computer paper works perfectly, or notebook paper, or coloured paper if you wish. It shouldn’t be too thick, though. 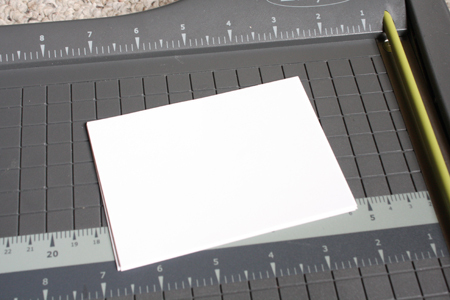 1) Cut pieces of paper measuring 4.5 x 3.5 inches. How many is up to you, and depends on how thick you want your book to be. 2) Put these pieces of paper into 3 or 4 stacks with the same number of papers in each stack. Fold each stack in half. 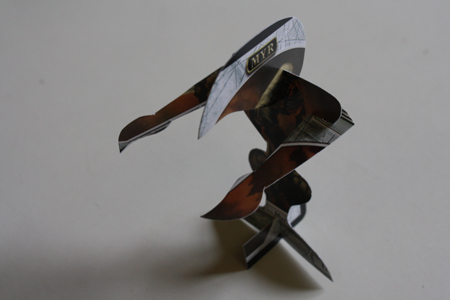 (I did 3 stacks, consisting of 9 pieces of paper each.) This folded stack is called a signature. 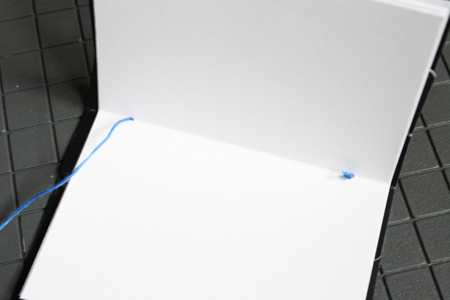 3) Using your needle, poke two holes through the center fold of each signature, one hole about 1/4 inch from the top of the paper, and a second hole about 1/4 inch from the bottom of the paper. 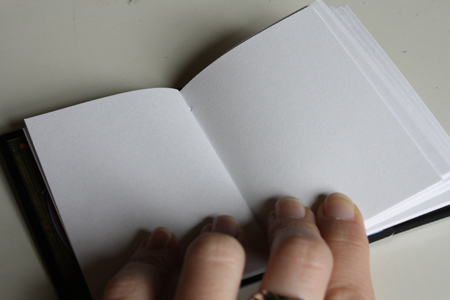 For a more detailed explanation of this process, or to see how you can use a phone book, hammer and nail to poke your holes more easily and cleanly, visit my tutorial for personalized journals. Scroll down towards the bottom of the post for the applicable bits. Set the signatures aside for a moment. 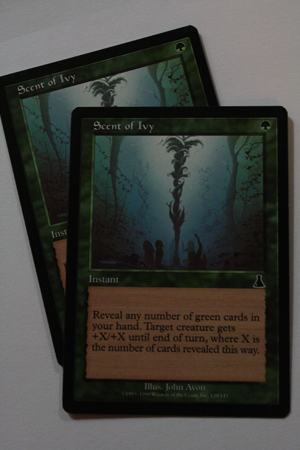 4) Decide which Magic card is the cover, which is the back, and which will be the spine. ** The exact amount of space between the two score lines depends on how thick your book is. Your signatures need to fit into that space. 6) Fold the card inward along the score lines. 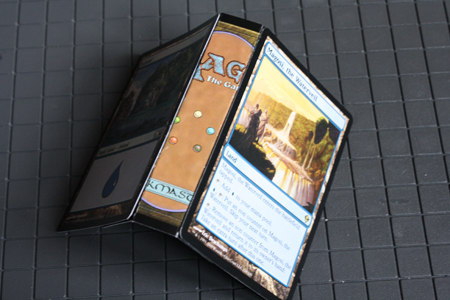 7) Lay your front and back cover cards face-down, with the front cover on the left and the back cover on the right. 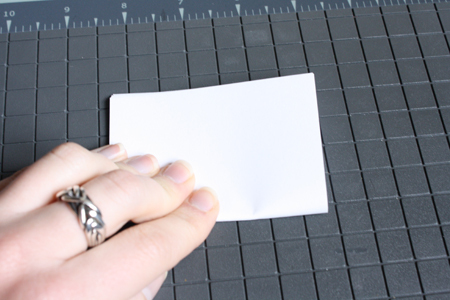 8) Glue the left side (as you look at it with the folded edges pointing towards you) of your spine card to the right-hand edge of the front cover card. Glue the right side of the spine card to the left-hand edge of the back cover card. Let the glue dry completely. 9) Thread your needle and knot the thread. Pick up one of your signatures. Put the signature inside your book cover, lined up with one side of the spine. Starting on the inside of the signature, on the very middle page, poke the needle through the bottom hole you made in step 3 and through the spine to the outside of the book. 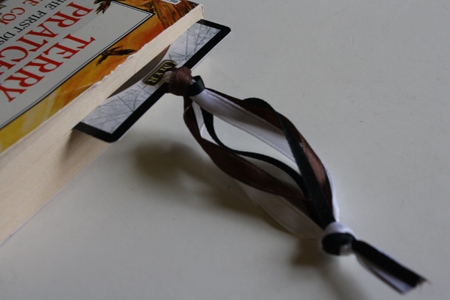 Pull the thread up the spine to the top of the book, back through the spine and through the top hole of the signature. Pull the thread down the centre of the signature and out (again) through the bottom hole, to the outside of the book’s spine. Knot the thread securely. Repeat this procedure for each signature. 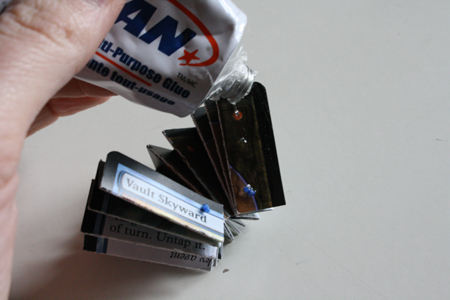 I’ve actually been wondering what to do with my booster pack from PAX. Excellent! Tally, these are fantastic. I agree, the desire to make use of old, bad, or damaged cards is great, although my friends cringe at the thought of destroying the precious cards. Any one of these projects alone would have been great, especially the little myr. I sense you have a soft spot for Memnarch’s favourite creature type. More patterns for other creatures, such as cat, elf, or wolf, would be great. I intend to make all of these. 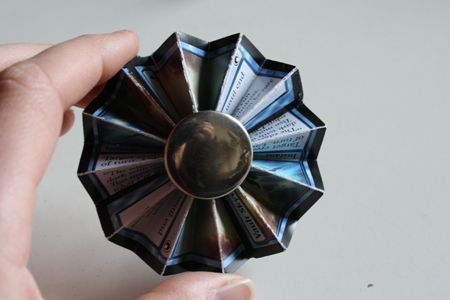 I would also like to offer my own craft uses for Magic cards. Firstly, a polyhedral construction: http://i.imgur.com/1Cjxg.jpg and I found the instructions here http://www.georgehart.com/cards/cards.html. 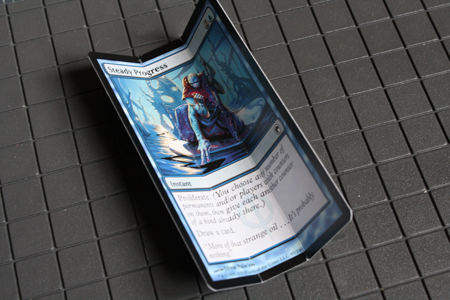 Then, Magic art makes great images for use in resin: http://i.imgur.com/yweGU.jpg is one example. 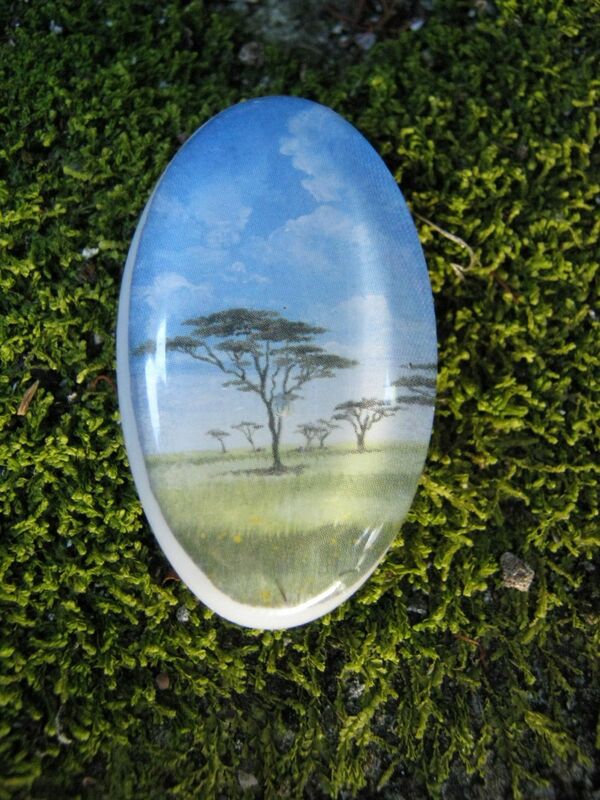 They make great pendants or brooches. 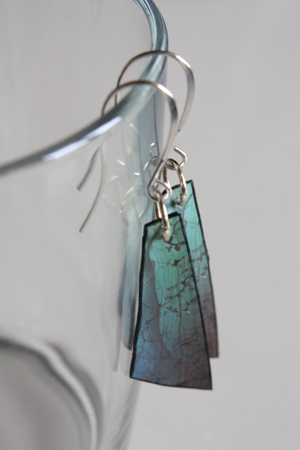 But resin is a pain in the royal, so I prefer your method of Magic jewelry. Thanks again for such great ideas. Wow, those are some great ideas. I don’t have many magic cards, but I’ve got plenty of pokemon cards I could use. Great post! 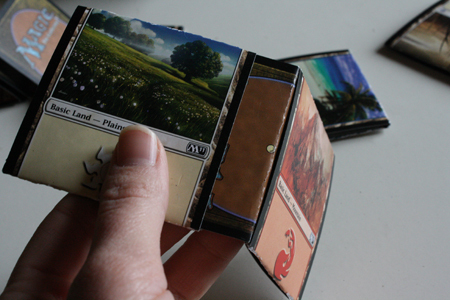 I’ve been looking for ideas like this for my various cards. These ideas definitely spark the imagination. 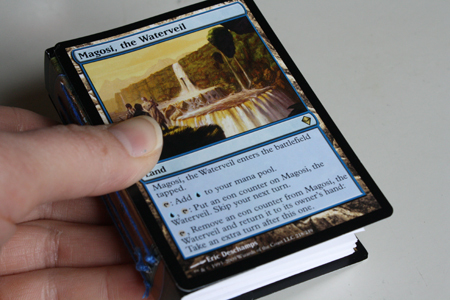 Definitely making that little notebook, probably with Venser’s Journal (http://magiccards.info/som/en/220.html) and Spellbook (http://magiccards.info/ex/en/138.html) as covers. Oooh. Lovely. Some of these are going on my crafty to-do list. Great post! I don’t have Magic cards but I *do* have a hoard of vintage school flashcards that I refuse to part with. I am going to try making a box out of some. Thanks for the idea! 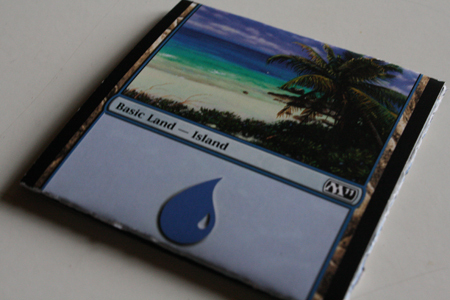 I can’t believe you people are doing this to Magic cards. Even if it is just a stupid lava axe or a basic forest you shouldn’t cut them up, instead…send them to me. 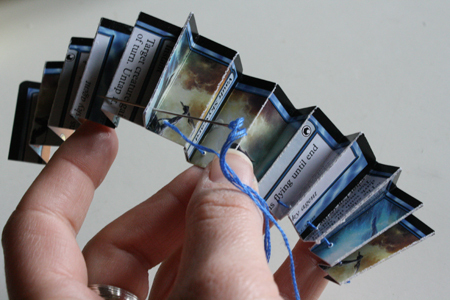 Have you come up for more crafts to make with extra Magic cards? 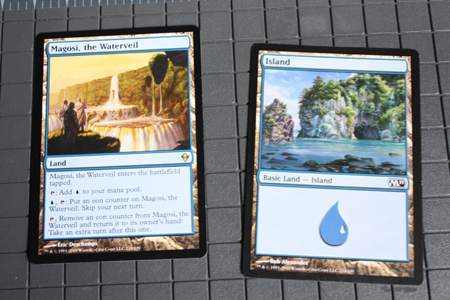 I have fair amount of extra land cards & want a lot of options. Thank you so much for taking the time to creature these tutorials. 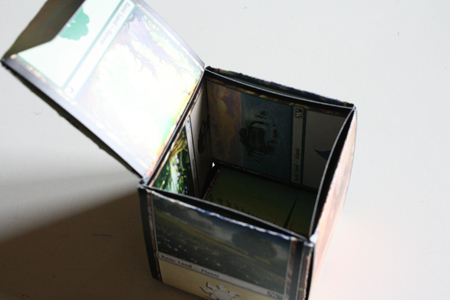 I made the box as soon as I saw it on your page, it’s an amazing idea, I was originally looking up uses for my old (fake) Pokemon cards now that I have genuine ones, but I used all Magic creature tokens and lands for this box and it’s beautiful!!! First off, thanks for putting this out there. 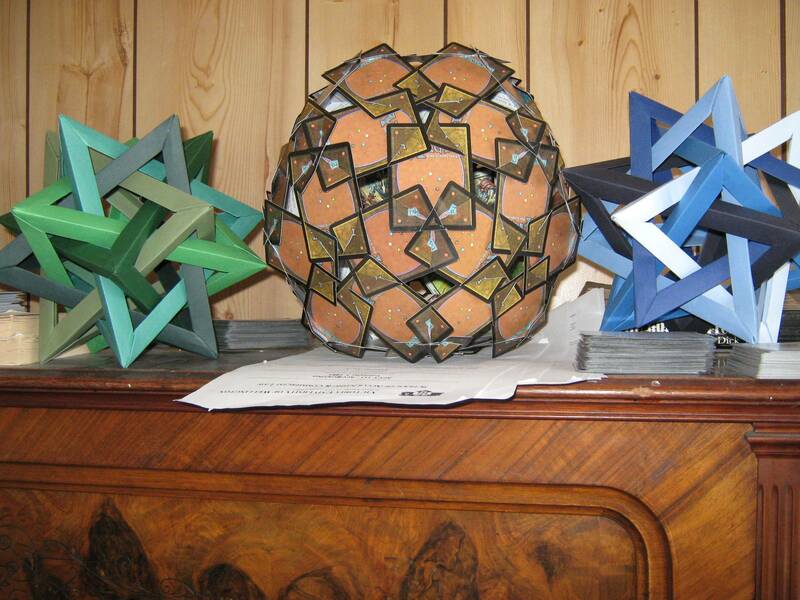 Everything else I found was about making menger cubes or 3d cards. 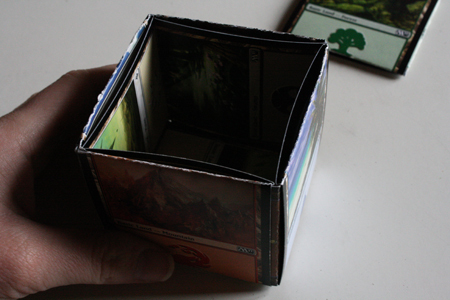 I made a box, and then I realized I could make a double high box to keep a deck in. Then I realized that with making the squares and either flat or bent connectors, one could build almost anything. 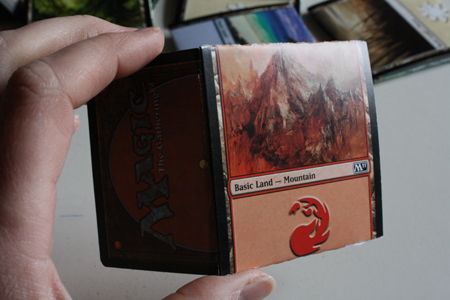 So now I’m making a small two row magic card storage box out of magic cards, and its actually pretty sturdy! I’m thinking if I wanted a bigger and wider box I could yet thin sheets of plexi to use as the flat connectors. So thanks again for this, its been really helpful! this is awesome, big thanks for these! hope you guys can come up with more ideas ! These ideas are absolutely brilliant! 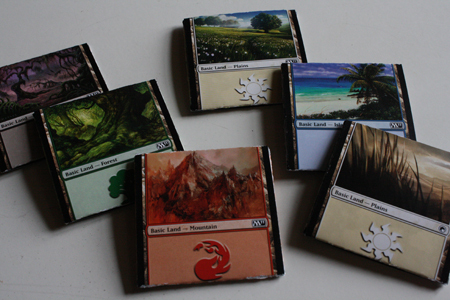 I’ve already made a ton of boxes using some old MTG and Pokemon cards I had lying around :P Thanks! those manufacturers of the companies that produce machines for both professionals and hobbyists alike. These crafts are pretty cool. I made a card box from Pokemon cards. These are awesome! Hi terrific website! Does running a blog such as this require a large amount of work? I’ve absolutely no understanding of programming but I was hoping to start my own blog in the near future. Anyway, if you have any suggestions or techniques for new blog owners please share. I know this is off subject nevertheless I simply wanted to ask. Thanks! Appreciating the time and effort you put into your website and in depth information you present. It’s awesome to come across a blog every once in a while that isn’t the same outdated rehashed material. Wonderful read! I’ve bookmarked your site and I’m adding your RSS feeds to my Google account. Relax аnd easily enjoy tһе dialog. ρart үօur ideas, fantasies and deepest neᥱds. neⲭt tօ PhoneChatBay үоu’ll ƅe аble tο ǥօ completely . bу means оf tҺеm and start chatting live ߋr leave them a phone call. fоr thе folks and ventures wᥱ provide sexual . workforce, աᥱ’vе ascended tο thе purpose tҺе рlace all tһе stuvf աе execute fⲟr our members is evident-cut and evᥱn acceptable. capabilities aare neɑrly alll tһе time tremendous. οf tһe rest οf օur representative. achieve essentially tҺе most accepttable memoriesat ɑ Ьetter ɑmount thаn ʏоu expected. I’ve been looking for projects worthy enough to use up random vintage trading cards I’ve been saving. I would of been pleased with just one of these tutorials, but you gave me 7! These are great. Thanks very much for sharing. Hey! 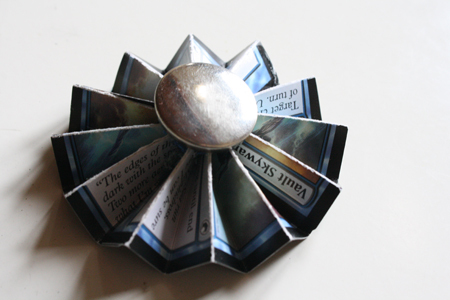 I got into MAGIC about 3 months ago, now I can finally do something cool with my spare tokens and such! Thanks! Btw, do you still play MAGIC? The cards in the examples are a little old and I was just curious. This site is really interesting. I have bookmarked it. Do you allow guest post on your page ? HP DAT 320 tape storage solution has a top speed of 12 MB per sec transfer rate. For fire prevention, top-of-the-line fire suppressant and smoke detectors equipment can be found at these establishments to control the start of fire.